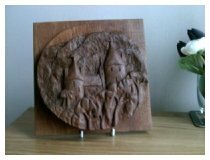 Some carvings are also available through my Etsy shop. 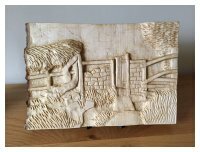 This carving is just over 9.5" (24cm) by 6.5" (16.6cm) and the wood just under 1" deep at its thickest point. It has an uneven bark edge down one side. 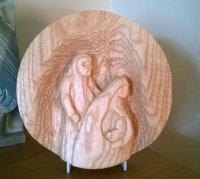 It is carved in figured ripple sycamore and finished with Danish Oil then polished. It comes with a stand but I can add hanging hooks etc if needed. 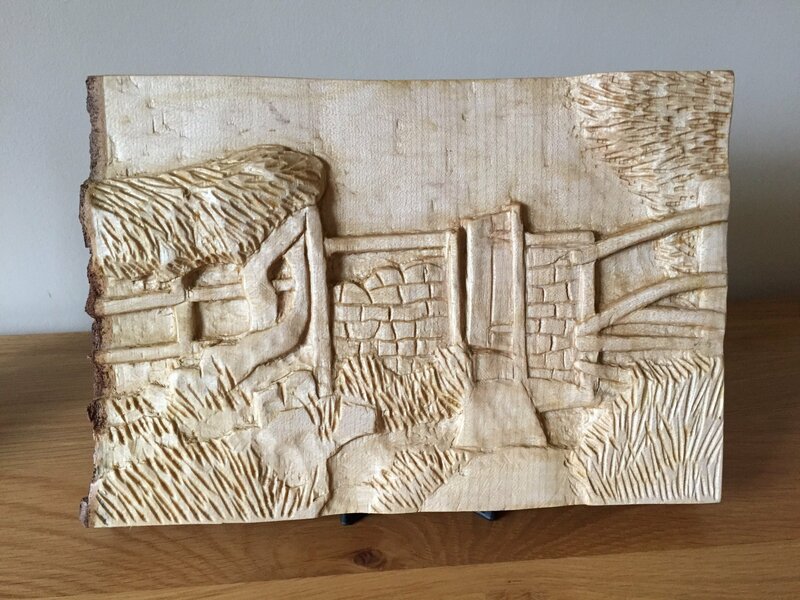 I did the carving from a photo I took on a walk on the outskirts of Leyburn in North Yorkshire where I live. It can be purchased through my Etsy shop. This carving is just over 8" (21cm) diameter and the wood just under 2" deep. 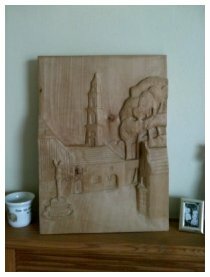 It is carved in olive/ripple ash and finished with Danish Oil which shows the grain beautifully. It has hooks and a wire for hanging but can also be positioned on a stand. 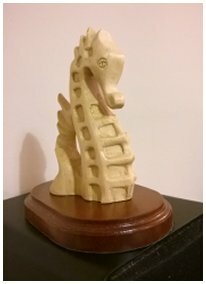 This carving is on a twist to show the movement of a seahorse. It is in lime and fastened on a polished wooden base after waxing. The carving itself is just over 5" tall and approx 4" front to back, and 2" wide. This castle was build in the late 1800s near Tongwynlais, north of Cardiff, South Wales. 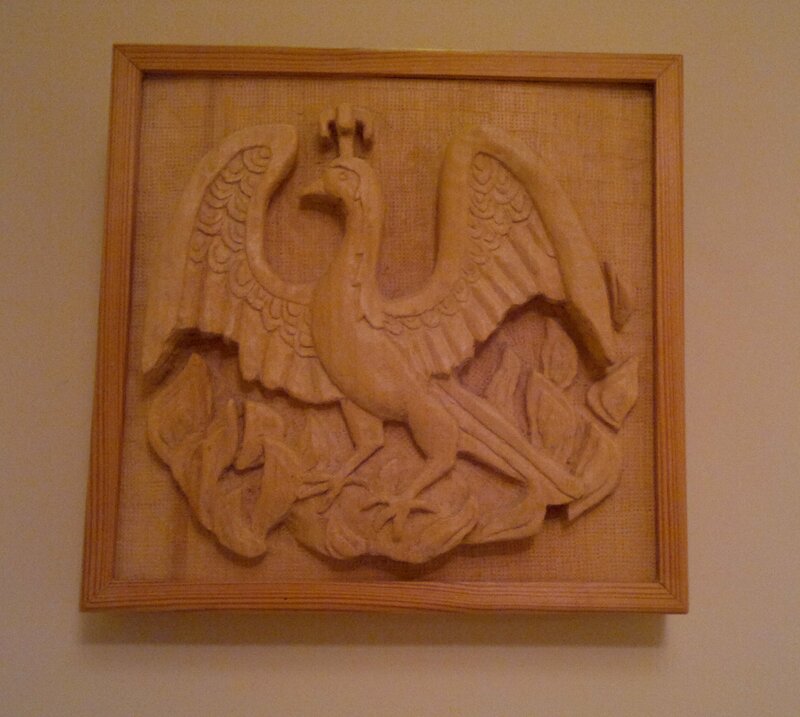 The carving is in mahogany and waxed. Sized 9" square and 1" deep. The background is textured. 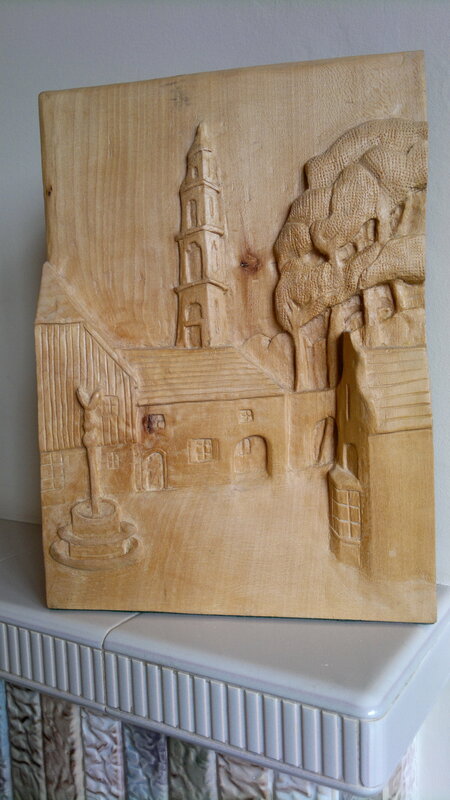 This is a deep relief of a few of the buildings in the marvellous village where The Prisoner was filmed. It's 12" high, 8.5" wide and just under 2" deep. It's another one which has been on the go for years! 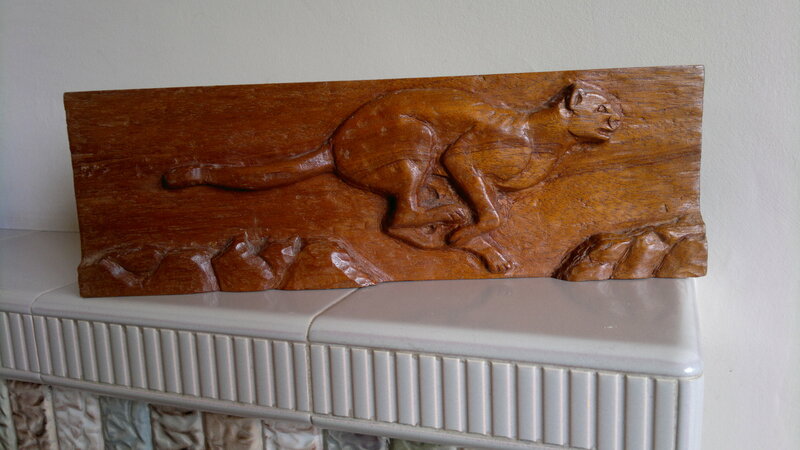 This was my first woodcarving and shows a Cheetah leaping between some rocks. 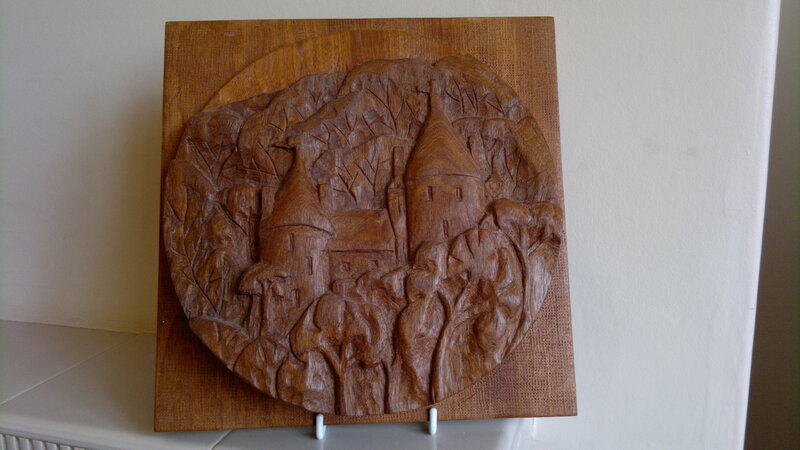 It has been carved on a piece of mahogany frame and polished. It's sized approx 12" by 4" by 1.5". 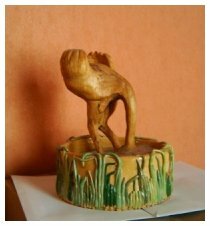 This is a woodcarving of an Ostrich with his head in the sand. I'm pretty sure it's Lime. The wood is spalted and was carved while green. It's sized approx 7" by 4" by 4.5". It comes in a stoneware bowl that I made in pottery class. The ostrich has his head buried in sand (also supplied). Bowl diameter about 7", depth just under 3". 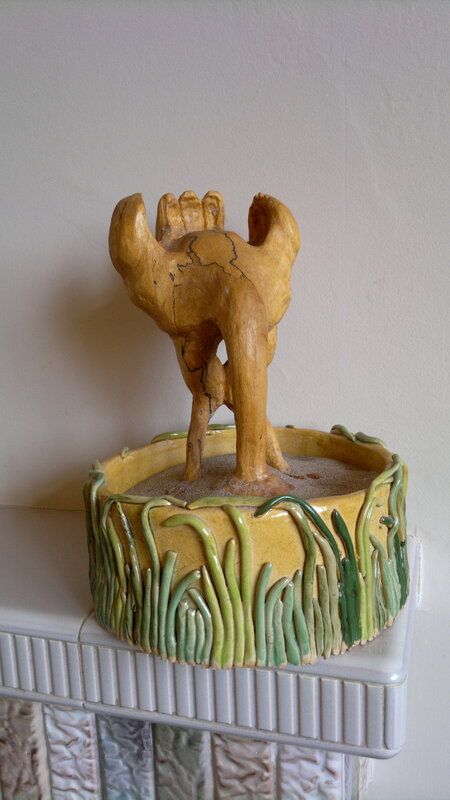 I worked in clay for four years and this was the first time I combined both mediums. 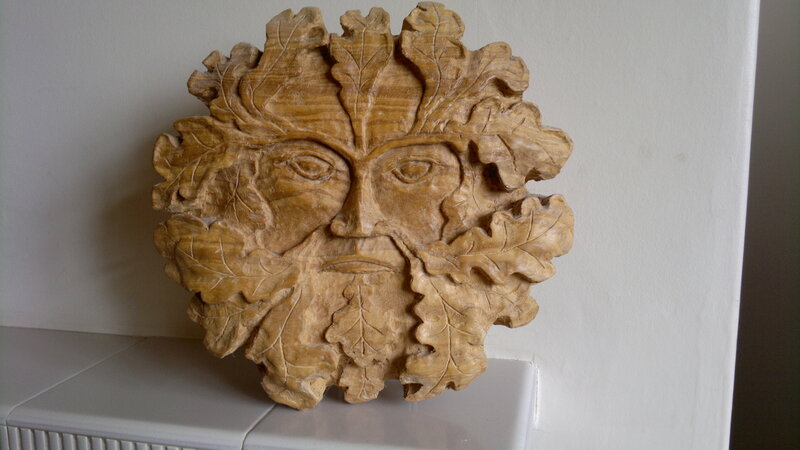 This carving of a Green Man is in Olive Ash and sized approx 10" diameter and 2.5" deep total including the back. The back of the carving has hooks/wire for hanging and has been turned to add depth. 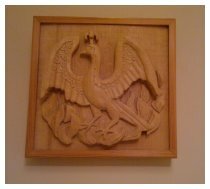 This woodcarvings showing a Phoenix in Flames is probably Lime and sized approx 9" by 9" and 2" deep total. The background surface has been textured. The back of the carving has hooks/wire for hanging and felt covering. It also has a wood frame.